While the work on British cemeteries was going on the Volksbund Deutsche Kriegsgräberfürsorge had begun to make German burial sites manageable and more permanent. Today modern visitors to the Western Front are used to mass commemoration at German war cemeteries and few perhaps realise that once every grave was individually marked, often with unique and impressive headstones. 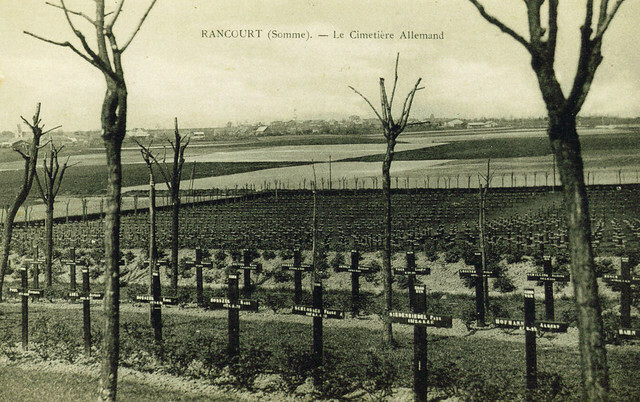 This image of the German graves at Rancourt, on the Somme battlefields, is a typical example; it shows rows and rows of individual crosses each to an individual soldier: today the same cemetery has grey stone crosses, each one commemorating a minimum of four soldiers. As the clearance of the battlefields was coming to an end and the cemeteries established, work on making them permanent began. 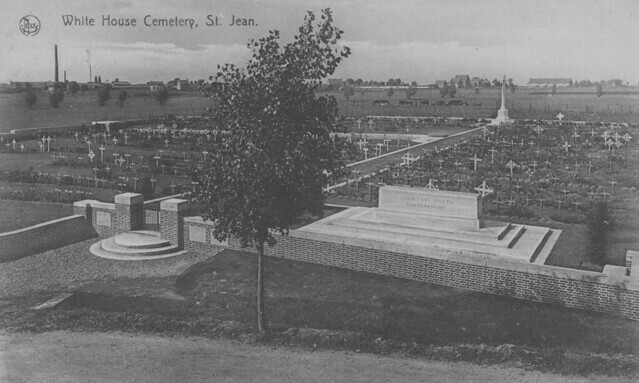 Initially it had been discussed that the wooden crosses as featured in last weeks post showing Acheux British Cemetery would simply be replaced by stone ones. In the end headstones were chosen as it was felt more information about the casualty could be recorded on them. Several locations were chosen to become ‘experimental cemeteries’ – sites where the initial plans for permanent commemoration could be seen and demonstrated. 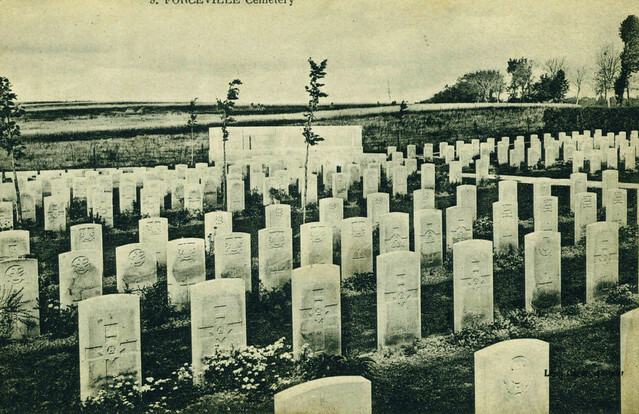 Forceville Communal Cemetery and Extension on the Somme battlefields was one site, pictured here in 1921 just after the cemetery was finished. 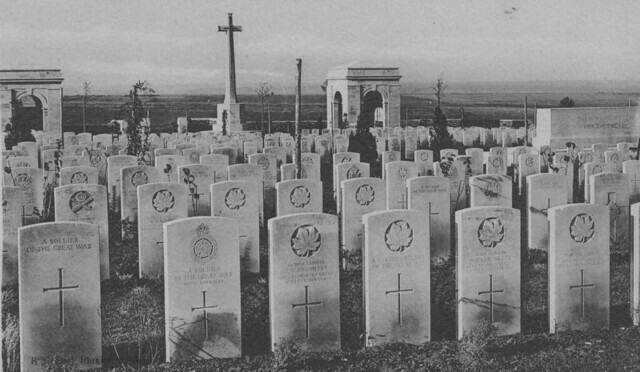 The crosses had been replaced with headstones and a Cross of Sacrifice, which would become commonplace in all major war cemeteries, had been erected along with the Stone of Remembrance seen in the background here. Forceville was one of the locations visited by King George V during his King’s Pilgrimage in 1922. The so-called ‘Silent Cities’, the soldier’s cemeteries of the Great War, numbered in the thousands when the conflict came to an end. While the war was no there had been no thought towards permanence or any architectural design and the then Imperial War Graves Commission (IWGC) and now Commonwealth War Graves Commission, were faced with a huge task of properly recorded what was in the existing cemeteries while their senior staff looked at ways to ensure the war dead would be properly remembered on a long term basis. 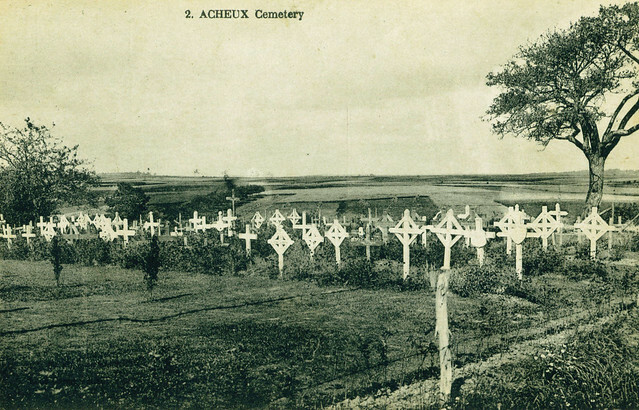 This image of Acheux British Cemetery was taken in 1920 and shows a typical Somme cemetery at this time; in good order and with graves marked by wooden crosses. Acheux had been behind the British lines in 1916, but had seen fighting again in 1918 but the fields beyond the cemetery show how an area so close to the battle area could largely escape the hand of war. The early pilgrims to the battlefields saw cemeteries like this and the IWGC were busy during this period photographing graves for the next of kin. But a permanent solution had to be found and the next phase of the IWGC’s work will be featured in next weeks post.